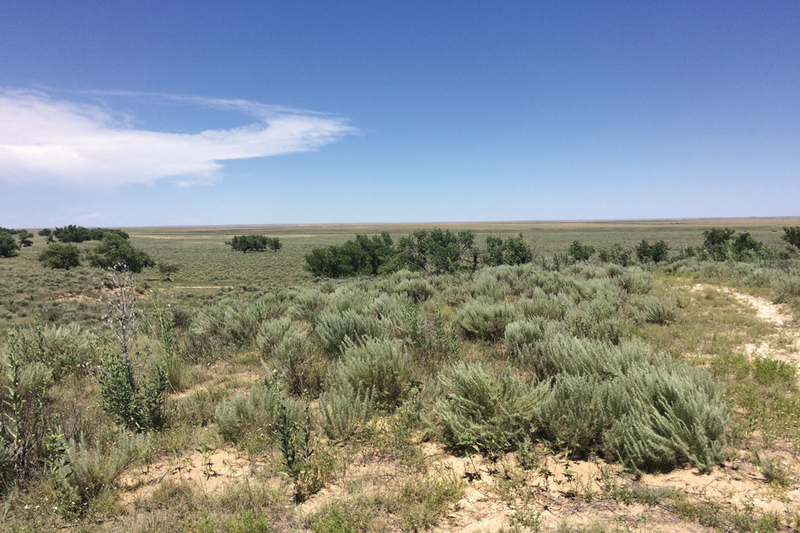 Sand Creek Massacre National Historic Site in Eads Colorado. On November 29, 1864, US troops attacked the peaceful Native American village of the Cheyenne and Arapaho tribes at Sand Creek. John Evans, founder of Northwestern, was territorial governor of Colorado at the time. Karen Little Coyote returns every year to Sand Creek, the place where her ancestors were massacred over 150 years ago. She finds only sagebrush, sand and heavy silence as she walks down to the waterless creekbed, imagining the bloodshed that occured in such a quiet corner of the world. On November 29, 1864, the 1st and 3rd Colorado Regiment, commanded by Colonel John Chivington, attacked the peaceful Native American village of the Cheyenne and Arapaho at Sand Creek. Under the tribe’s white flag, the soldiers slaughtered over 200 men, women and children and mutilated their bodies. John Evans, a founder of Northwestern, Evanston and the University of Denver, was the territorial governor of Colorado and the state superintendent of Indian affairs at the time of the massacre. One hundred and fifty four years later, students, administrators and faculty at Northwestern continue to grapple with the impact of the massacre and the role Evans played in it. A pair of 2014 reports commissioned by NU and the University of Denver ended with conflicting conclusions but found that Evans fostered an environment that made the massacre possible and refused to acknowledge it ever took place. While Northwestern hasn’t taken the stance of DU’s report that Evans was “deeply culpable” for the massacre, it has launched a broader effort to strengthen its relationship with Native American communities, even acknowledging for the first time at commencement this year that it sits on indigenous land. As a part of the University’s effort to improve the campus climate for Native Americans, the Native American and Indigenous Student Alliance hosted four descendants of the massacre earlier this month: Otto Braided Hair, Fred Mosqueda, Gail Ridgely and Little Coyote. Jasmine Gurneau, the senior coordinator of Native American and Indigenous initiatives, said this was the fifth year NAISA commemorated the massacre and the second year they’ve invited descendants. Finally, this past weekend, three Northwestern students travelled to Colorado to see the massacre site and participate in the 20th annual Sand Creek Massacre Spiritual Healing Run/Walk. Gurneau said this was the third year the University has sent students to the run. In 2012, students and faculty began to raise questions about Evans and his role in the massacre. Students asked the University to remove Evans’ name from all University buildings and started an information campaign to spread awareness about NU’s ties to the incident. Administrators formed committees to investigate Evans’ role and make recommendations to reconcile this past. Though knowledge about the massacre has improved since she started at NU three years ago, Copeland thinks her classmates still don’t know much about the Sand Creek Massacre. Students need to seek out information, but they often don’t know where to start, she said. But beyond NAISA, Copeland would like to see the University encourage all students to reconcile with Sand Creek and John Evans through a mandatory course or programming during Wildcat Welcome. Ari Kelman — a history professor at the University of California, Davis and author of A Misplaced Massacre: Struggling Over the Memory of Sand Creek — said people in Colorado and at the University of Denver have a more “immediate, day-to-day connection with Sand Creek.” Even though Northwestern is 1,000 miles away from the site of the massacre, he said students must realize they all live and learn on indigenous land. In the process of creating relationships with the Cheyenne and the Arapaho through the documentary, Gurneau said the University has taken “extra steps” to make sure they approve of the final version. She said she and associate provost and chief diversity officer Jabbar Bennett visited the annual consultation at the Sand Creek Massacre National Historic Site to present the documentary. The four tribes affected by Sand Creek — the Southern Cheyenne, Northern Cheyenne, Southern Arapaho and Northern Arapaho — are all sovereign nations with their own legal systems, Gurneau said. All four have official representatives of Sand Creek Massacre descendants, and the University welcomed them like any important governmental guest, Gurneau said. Gurneau added that they have different connections with tribal representatives in the Great Lakes region, including an economic relationship. At the opening of the newly-renovated Welsh-Ryan Arena this fall, University officials honored leaders from the Menominee Nation, whose lumber was used to build the basketball court. Kelman said University of Denver and NU as institutions try to reconcile themselves with the actions of John Evans, but tribes themselves have not experienced reconciliation with the government. In particular, he highlighted the 1865 Treaty of Little Arkansas which promised land and reparations in the aftermath of the Sand Creek Massacre — promises the federal government never delivered. For Little Coyote, reconciling with Sand Creek means taking time every year to tell the story of her ancestors, participating in the healing run/walk and reminding her family that they must be proud of who they are and where they came from. Little Coyote tells her family that her great, great-grandfather Black Kettle was a peace chief. He put up a white flag of surrender, but American troops attacked him and his people anyway. He survived but was killed almost exactly four years later by US soldiers at the Washita Massacre.